Exquisite jewels and precious materials are celebrated in eyewear, with iconic style and superb crafting – jewels for the eyes. 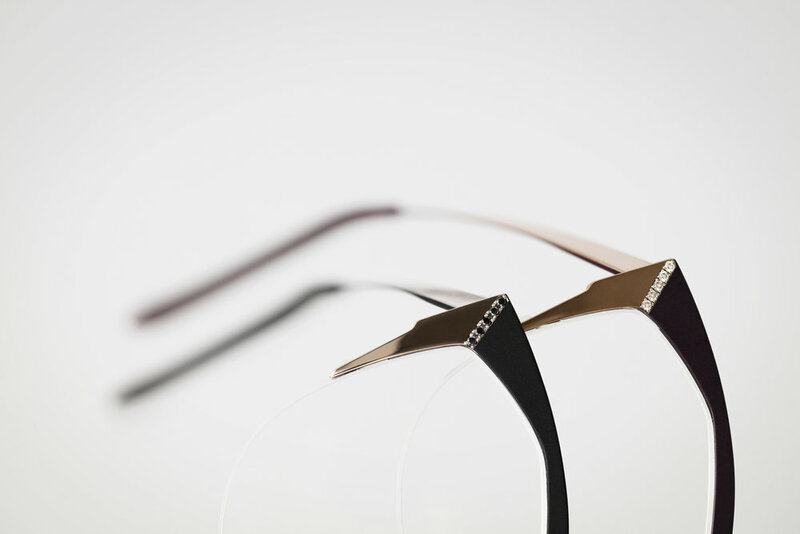 FALVIN´s line of exclusive diamond frames is customized with sparkling diamonds. The frames are handmade by one of the best Diamond specialists in Denmark, and the exquisite diamonds are mounted using traditional techniques to ensure a long-lasting quality. FALVIN is leading innovator in luxury and the frames have a contemporary and elegant look, that suits both for business and pleasure. Offering a supreme level of comfort and a statement shape in the state-of-the-art material. Using techniques that can only be mastered by hand, the beautiful two-tone base silhouette offers a luxury expression with black, champagne, or white Top Wesselton diamond settings to create a personalized look. Birgitte Falvin has studied this element for the finishing of her distinctive eyewear, creating a one-off luxury detail that is both gentle yet sparkling – to catch the beholder’s eye. The innovative diamond setting is of the highest quality, assembled by a top jeweler in Denmark, appointed by Falvin Eyewear.